Feeling hungry? 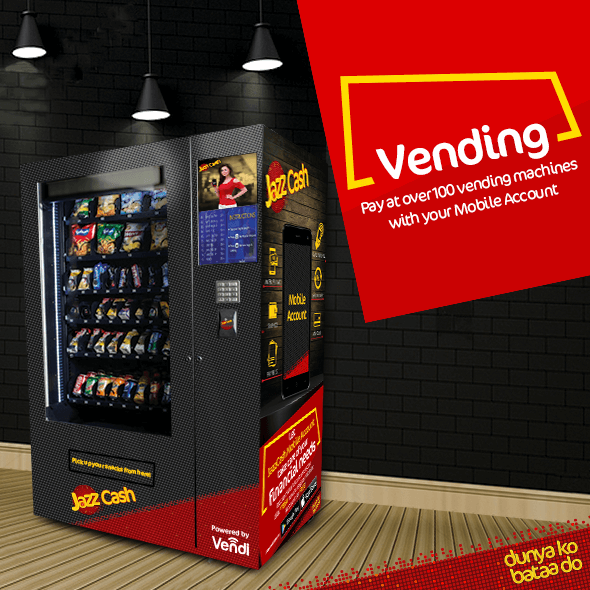 Now visit your nearest vending machine and buy snacks with convenience through your JazzCash Mobile Account by entering your Mobile Number or tapping NFC tag. JazzCash aims to provide convenience to its valued customers through these innovative vending machines located at various universities, offices and shopping malls. Carrying cash is no longer needed! Transfer funds from any bank account through your desired ATM by selecting Mobilink Microfinance Bank (formerly known as Waseela Microfinance Bank) as the beneficiary bank and for account number provide your Mobile Number. Start making payments at vending machines placed at designated locations through your JazzCash Mobile Account by entering your Mobile Number or tapping NFC tag. You can get your NFC tag from Jazz Experience Centers at Lahore, Karachi, Islamabad and Rawalpindi for a one-time fee of Rs. 50 only. *Jazz/ Warid customers must keep their phones unlocked and other mobile operator customers must keep their app login to receive MPIN request. How can I open my JazzCash Mobile Account? Once registered, the customer needs to create MPIN for Mobile Account to start using it. How can I deposit funds to my Mobile Account? Deposit Cash from 75,000+ JazzCash agents nationwide, send “M” to 2179 from Jazz number to find out nearest Jazz Agent. Ask any friend or family member with JazzCash Mobile Account to send money to your Mobile Account. NFC (near-field communication) allows two devices placed within a few centimeters of each other to exchange data. In order for this to work, both devices must be equipped with an NFC chip. It is the quickest payment method. How to obtain NFC tag? You can obtain your NFC tag from Jazz Experience Centers in Lahore, Karachi, Islamabad and Rawalpindi. What are the charges for linking NFC tag? You need to have at least Rs.50 in your JazzCash Mobile Account, charges will be directly deducted from your Mobile Account upon NFC tag linking. An NFC tag will be pasted on a customer’s mobile phone, wallet or key chain, which will carry a unique identification number, that unique number will be linked with a mobile account. Once the NFC is linked with mobile account, customer can walk into any partner merchant and tap the NFC tag on Point of Sale to make payment. Are there any charges for performing a transaction at the vending machine? No, there are no charges to perform a transaction at the vending machine. What if my JazzCash NFC tag is lost/ stolen/ damaged? In this way you will immediately unlink your NFC Tag and payments cannot be done afterwards. What is my Mobile phone is lost/ stolen and it has NFC tag pasted? Unfortunately, if mobile is lost that has NFC Tag pasted on it then immediately call our help line: 4444, after basic verification your NFC Tag will be de-linked from your Mobile Account immediately. Can I re-link same NFC to Mobile Account? No, you cannot re-link the same NFC tag to your or any other mobile account. However, you can get a new NFC Tag for your Mobile Account. Can I use mobile phone built-in NFC for linking and payments? No, you cannot use mobile phone built in NFC for linking and payments. What if the item is stuck in the vending machine and payment is deducted? If you do not get a real time auto-reversal, please contact the Vendi helpline number, 0333-4411586 (also mentioned on the Vending machine) and register your complaint immediately to get re-imbursement. Can I buy multiple items in one transaction? No, you can only buy one item per transaction. I performed a transaction but I am not receiving MPIN, what should I do? Please ensure that your cell phone is unlocked to receive MPIN prompt. Customers of other mobile operators must ensure that they are logged into the JazzCash mobile app in order to receive MPIN. What is the expiry time for MPIN entry? Once you receive pop-up to enter MPIN, you must enter it within 100 seconds. Otherwise, the transaction shall expire.